In the midst of what is now a four-team race in the NL Central, the Milwaukee Brewers have added some help. 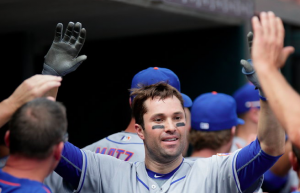 Late Saturday, the Brewers acquired second baseman Neil Walker in a trade with the New York Mets. Walker was removed from New York’s lineup less than an hour before their game Saturday night. He reportedly goes to Milwaukee for a player to be named later. The Mets are paying a portion of Walker’s remaining salary this season. The Brewers have struggled to find consistent production at second base for much of the season. Jonathan Villar and Eric Sogard have shared the position. But neither has been overly impressive. Villar has failed to follow up a breakout season in 2016. He’s hitting just .222 with an OPS of .627. Sogard was red hot when he was first promoted from triple-A in May. However, after returning from an ankle injury in July, he’s been ice cold at the plate. Meanwhile, Walker is a more established player the Brewers hope will provide steady and reliable production down the stretch. On the season, Walker is hitting .264 with an OPS of .780. He’s been a little slow to get going after missing more than a month of action with a hamstring injury. However, he has a track record across nine seasons in the big leagues that suggest he will put up solid numbers the final six weeks of the season. The addition of Walker could also help to rejuvenate the Brewers. Until Milwaukee earned a walk-off win over the Reds Saturday night, the club had lost six straight games. The Brewers have slipped to third place in the NL Central, a division they led somewhat comfortably at the all-star break. Trading for a player like Walker is a sign that the Brewers are making a concerted effort to reach the postseason. As for the Mets, Walker becomes the fourth player set to be a free agent after the season to be traded. Lucas Duda, Addison Reed, and Jay Bruce have already been traded. With the Mets unlikely to re-sign Walker this winter, there’s no sense in keeping him for the remainder of the season if a team like the Brewers is interested in acquiring him. Since the Mets are paying part of Walker’s remaining salary, there’s a chance the player to be named later will be a decent prospect. With Walker traded, Jose Reyes, Asdrubal Cabrera, and Wilmer Flores will share duties at second base for the Mets. That trio is also splitting time at third base. The Mets could also call up Matt Reynolds or Gavin Cecchini to get playing time in the infield. Of course, Walker going to a contending team like the Brewers is the most important aspect of the trade. If he continues to shake off the rust after spending six weeks on the DL, he could become one of Milwaukee’s most impactful players down the stretch. In a division as competitive as the NL Central, any bit of improvement could make a different. Adding Walker has considerably upside for the Brewers heading down the stretch.